There’s always been serious chemistry between fashion and animal prints. I’ve spent a good amount of time learning to style this daring trend. To me, leopard print is practically a neutral that works every day and any time. If you know how to style it right, the big-cat print (and other animal motifs) can be timelessly chic. The classic animal print has its permanent place in a women's wardrobe . This timeless trend has proved its staying power as it keeps coming back every season with constant updates and new & refreshing takes. The most important factor that makes the animal print never out of fashion is the fact that these add a little edge to your wardrobe, whether you want to keep it subtle or go all bold with your look. Also, since these prints could be found in neutral colours like black, brown and beige, you can wear them with almost anything. This fierce animal pattern is definitely a favourite with all and this season brings it in a variety of colours and iterations. So add a touch of this spotted go-to and embrace your wild side with prints and patterns inspired by the animal. 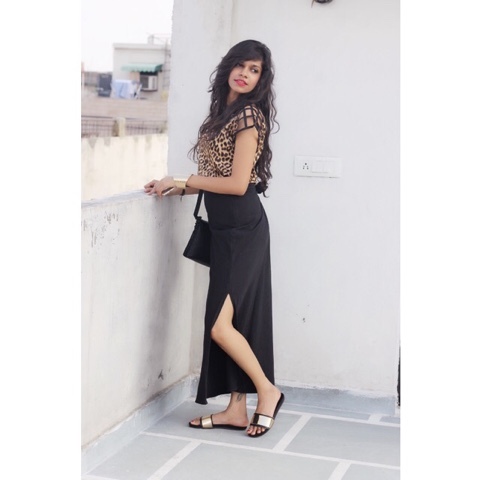 In this post i have paired an animal print top from MISSA MORE with black coloured long slit skirt.